Don’t Grip It… DANGLE IT! 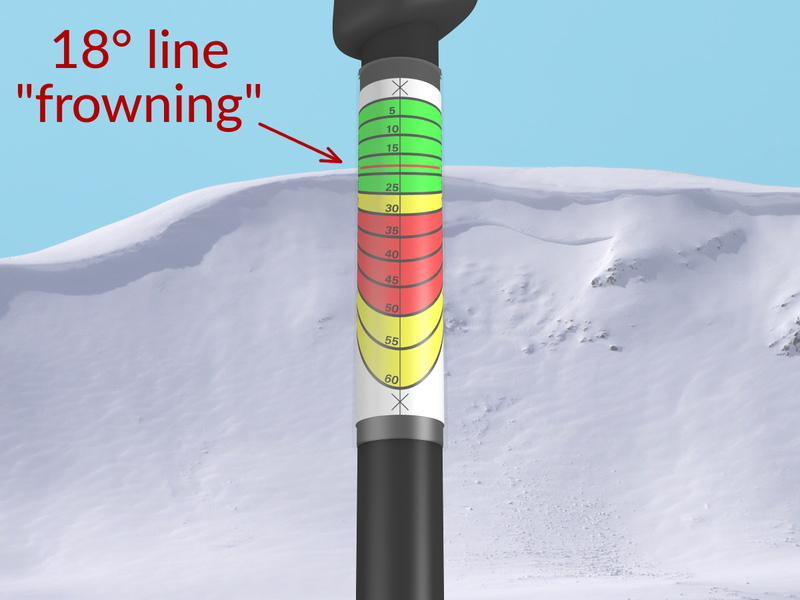 IMPORTANT: Your pole is your vertical reference. It must HANG FREELY from a loose grip, or your reading won’t be accurate. Use your DANG-A-LOOP (above center) if you have one, or just a loose 2-finger grip (above right), and DANGLE your pole so it hangs vertically. 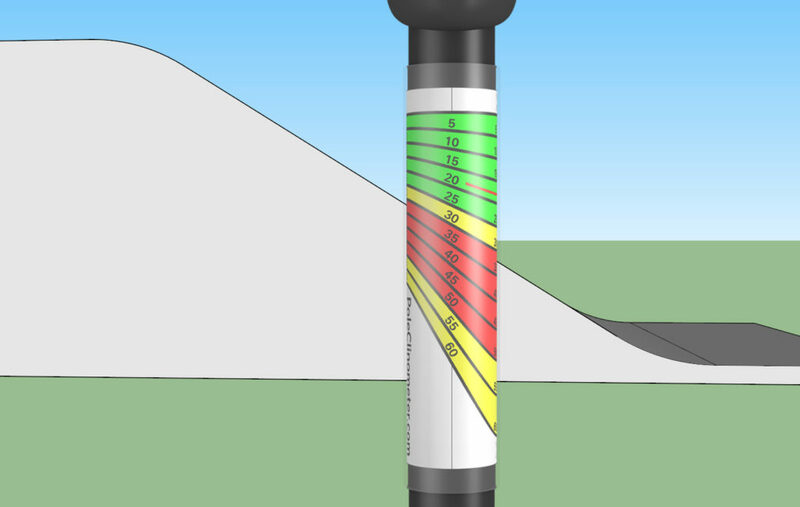 With a side view of a slope, sight across it as shown. 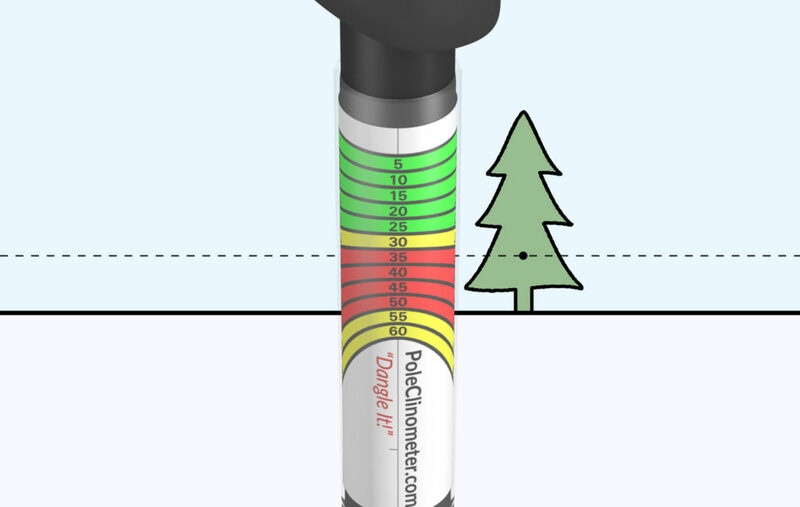 DANGLE your pole (see top of page) and look for the PoleClinometer lines that match the angle of the slope. Here the angle of the slope appears to be about half way between that of the lines marked “30” and “35”, so the slope angle is about 32 or 33 degrees. At the top of a slope, or from behind a convexity, sight down it as shown. Position yourself so your line of sight matches the angle of the slope. 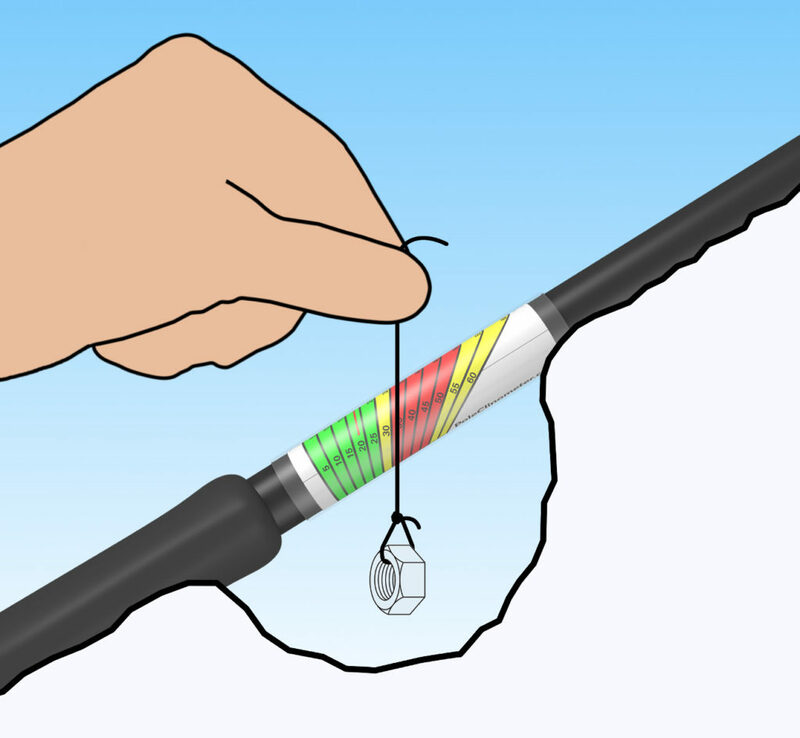 DANGLE your pole (see top of page) and look for the PoleClinometer lines that appear least curved in your line of sight. Here the line marked “30” is curved slightly up, while the line marked “35” is curved slightly down, to about an equal degree, so the slope angle is about 32 or 33 degrees. To measure the angle of a slope you’re already on, pick a reference object that’s directly up-slope or down-slope from you. Choose a point on that object that you estimate to be approximately as high off the snow as your eyes are, and sight to that point. 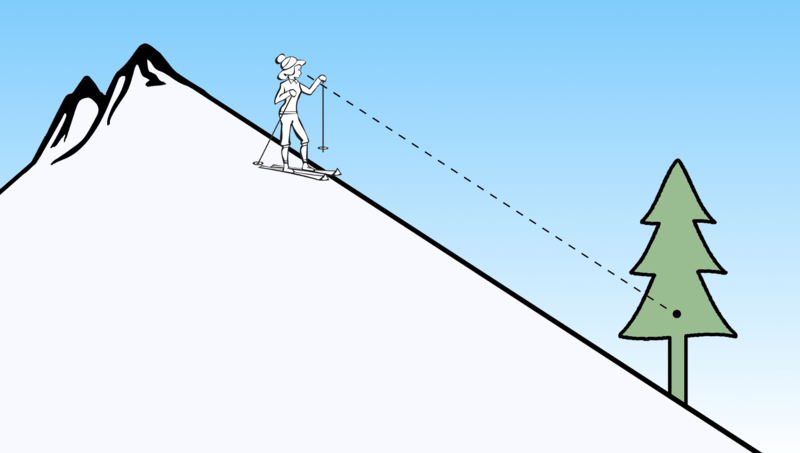 To measure the incline of the slope right at your feet, lay your pole on the snow as shown (eg. beside your snow pit) with a small hole dug out beneath the PoleClinometer sticker. Tie a small object to the end of a string, and use the string as shown to read the slope angle. Look for the PoleClinometer lines that match the angle of the string. Here the angle of the string appears to be about half way between that of the lines marked “30” and “35”, so the slope angle is about 32 or 33 degrees. 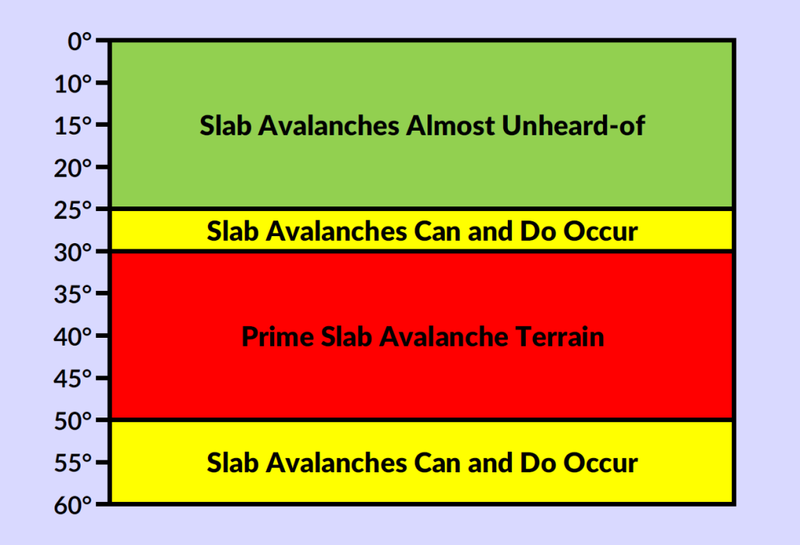 Alpha angle isn’t a measure of slope angle; it’s a measure of how far an avalanche will go. 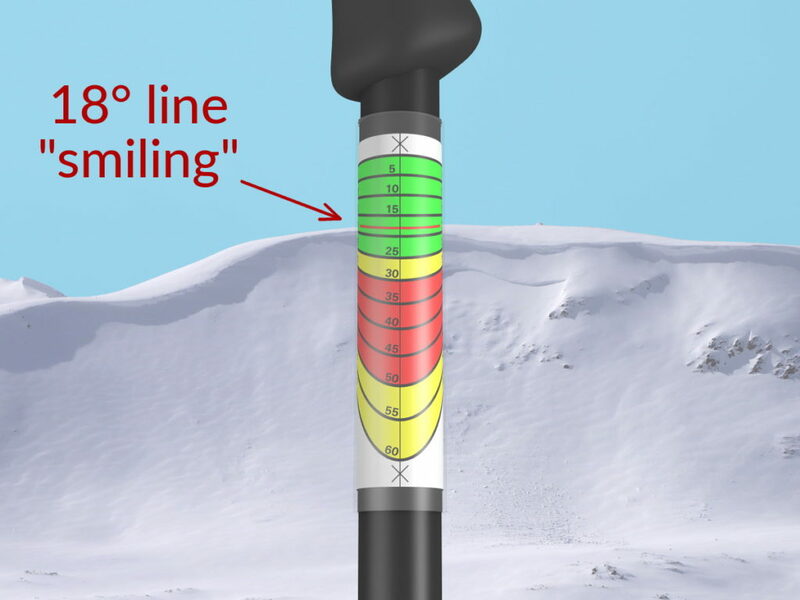 If you’re below an ominous looking snowfield, you can determine if you’re a safe distance from it by using PoleClinometer’s alpha angle feature. 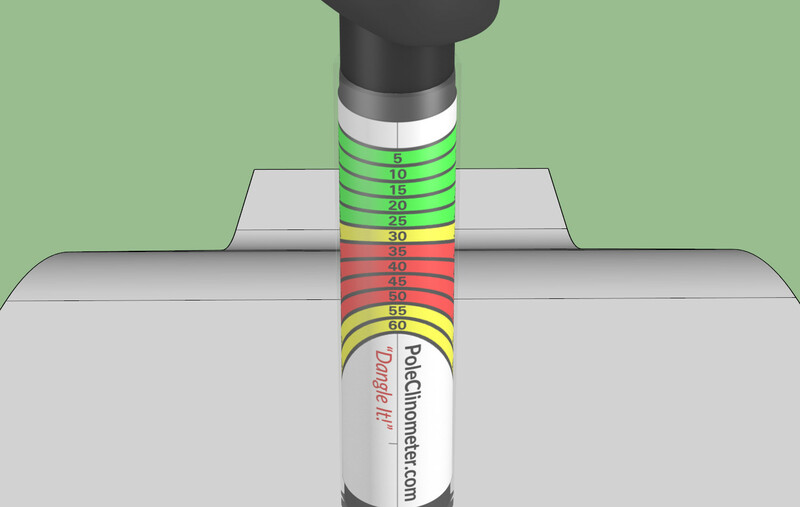 Look toward the suspect slide path, and DANGLE your pole (see top of page) so the highest possible start zone is directly behind PoleClinometer’s red 18° line. If the 18° line is curved up (“smiling”) as above, you’re in a good spot. You’re beyond the reach of even the biggest slide from that slope. If the 18° line is curved down (“frowning”) as above, you’re right in the firing line if a big one lets go. Might not want to linger here unless you’re confident there’s very low risk of avalanche on the suspect slope’s aspect etc. For more on alpha angle, read Alpha Angle for Backcountry Skiers here on this site. 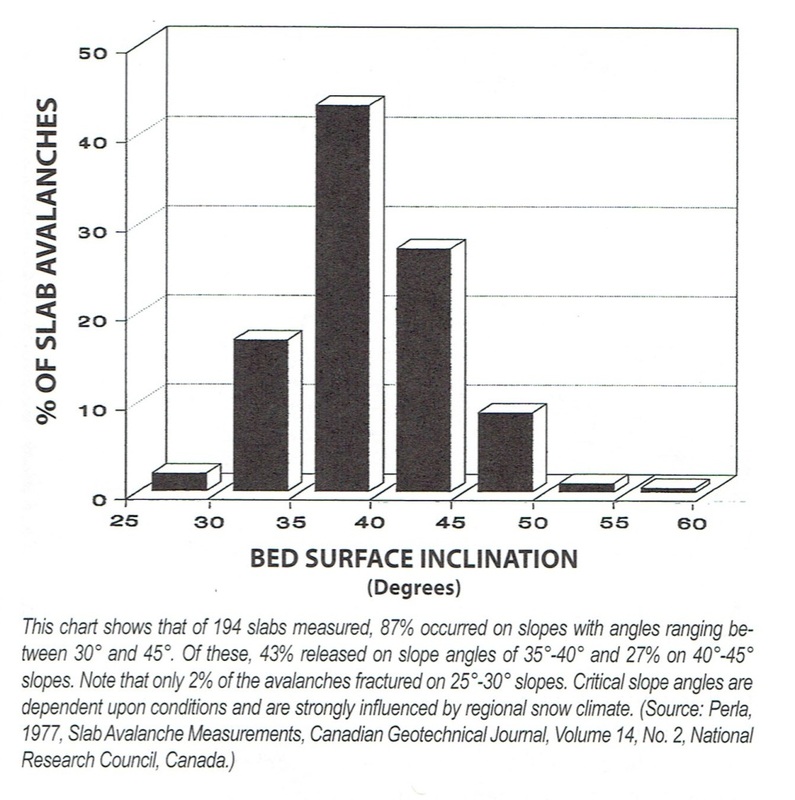 The below chart shows empirical data from a sample set of slab avalanche measurements in the Canadian Rockies. It is included here with permission directly from the pages of Snow Sense.